I won’t lie, I’m still a little scared of gluten-free baking. But what’s life if you don’t face your fears?? I tried out my first gluten-free recipe last weekend, when I made these rainbow cupcakes, and they actually turned our wonderfully! So when I got my first order for a gluten-free cake, I embraced the challenge, and made this GF Pink Velvet Cake. Preheat oven to 325. 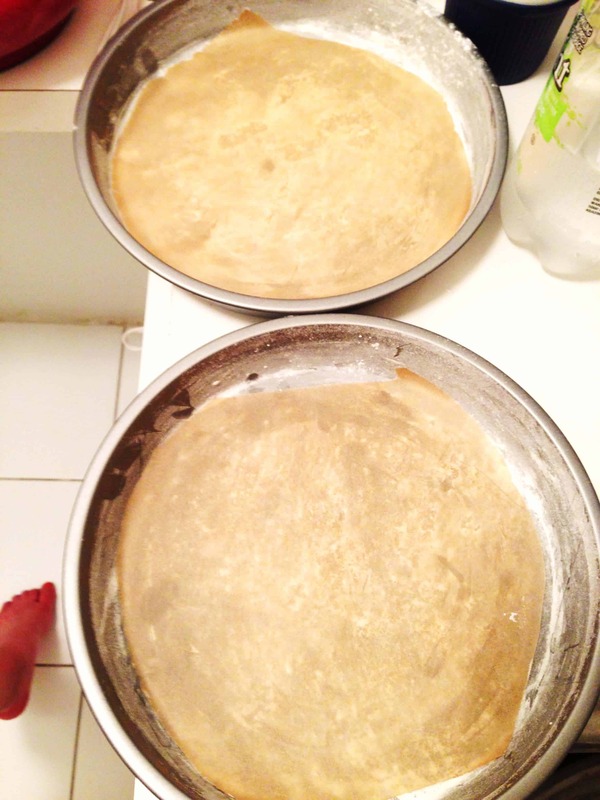 Grease and lay a strip of parchment paper in 9 inch round cake pans (see pictures). In a medium bowl, whisk together flour, baking soda, baking powder, cocoa powder and salt. Set aside. In a large bowl, combine the sugar, vegetable oil, eggs, buttermilk, vanilla and pink food coloring. Stir in the coffee, and white vinegar. 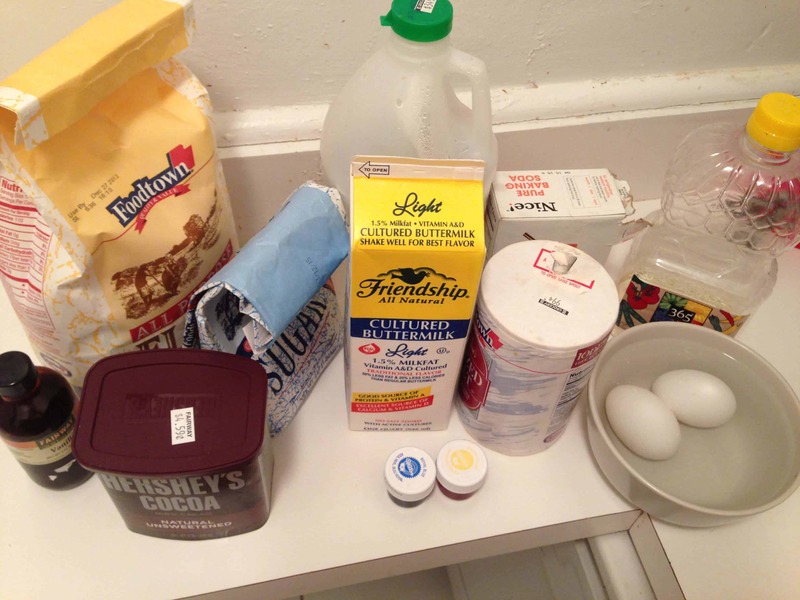 Combine the wet ingredients with the dry ingredients a little at time, mixing after each addition, until justcombined. Divide the batter evenly between desired number of cake pans.Bake on the middle rack for 18-22 minutes, or until a toothpick comes out clean. Bake time will vary based on how thick of layer you bake, but if you opt to use a 9 inch pan, and make 3-4 layers, this should be an accurate bake time. Keep a close eye on the cakes, you don’t want them to over bake! the layers also will continue to cook as it cools. Let the layers cool in the pan for about five minutes, then remove them from the pans onto a wire rack to finish cooling. Slide a knife or offset spatula around the inside of the pans to loosen the cake from the pan. Frost the cake with cream cheese frosting when the cakes have cooled completely. Lightly frost each layer, and then cover the entire exterior of the cake. Make sure to alternate the layers top up, top down, to help the cake remain level. Let this crumb coat harden over night, and reserve remaining frosting. Color in fading shades of pink, and finish frosting the following morning. 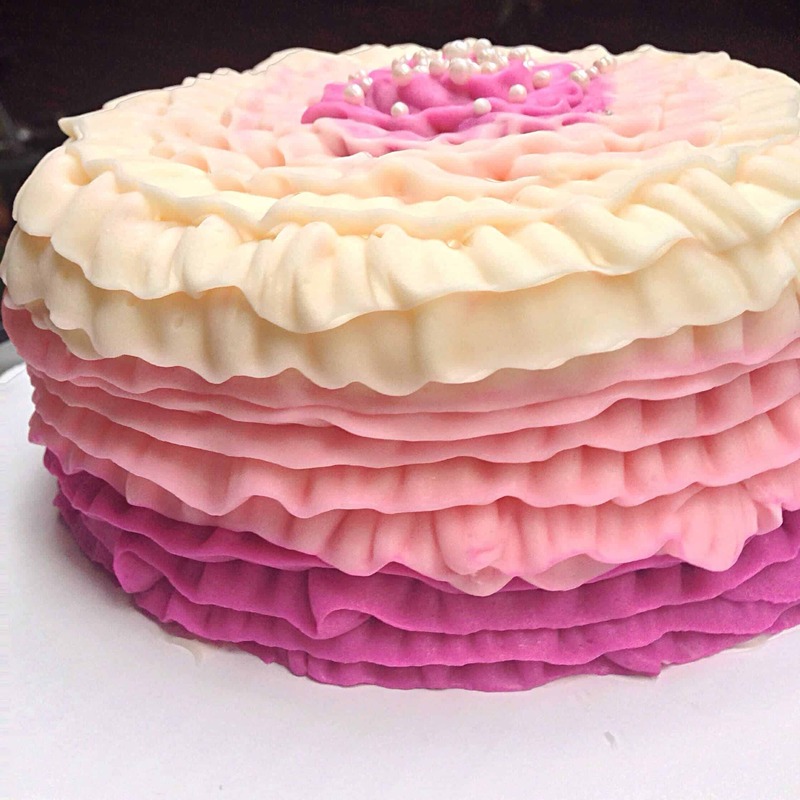 I decided to use my petal tip, and make fading ruffles. Oh my goodness – that is simply stunning! Completely stunning ruffles there . . . are you guys magicians? It would be slightly longer (2-5 minutes), but i’m not sure of the exact time! I’d just keep an eye on it and use your best judgement!